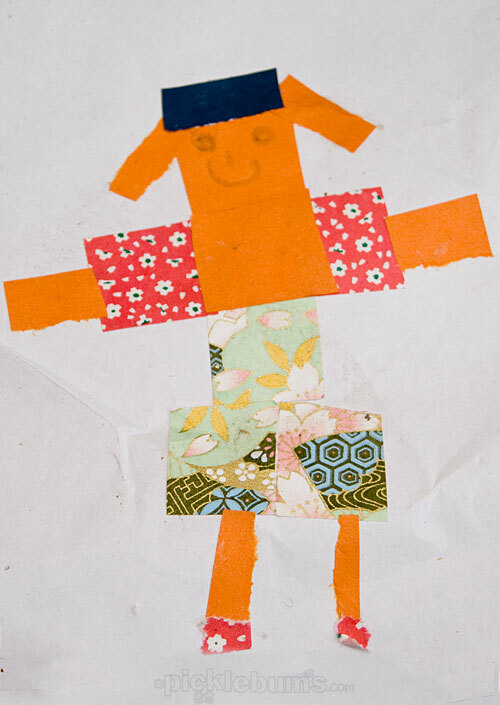 Art for Kids – Keep it Simple Collage. Sometimes I get carried away with ideas for fancy, elaborate, art projects. Sometimes I curse Play School for filling my children’s heads with ideas on how to create ‘a farm with real animals and grass’ out of two toilet rolls and a box of tissues. And sometimes I remember that the kids and I don’t need to do super, fancy, difficult, messy art projects all the time. Sometimes I remember to keep it simple…. 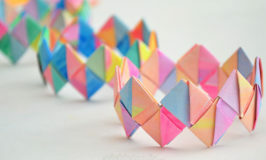 Just a a few pieces of coloured paper cut into simple little squares. A glue stick or other glue. 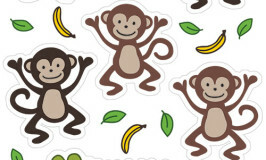 Paper or cardboard – cut the sides of empty cereal boxes they are great for collage. 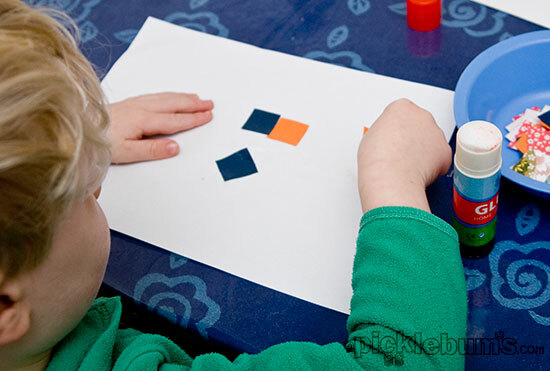 The smaller hands enjoyed the process of simply choosing paper and sticking it to the page. When the older hands cam home from school they enjoyed creating more elaborate designs. It was easy to set up, easy to clean up and fun for everyone. For more fun art ideas follow my Art for Kids (and Adults) pinterest board. Follow Katepickle – Picklebums.com’s board Art For Kids (and adults!) on Pinterest. Great idea! Like you said, simple ideas are good. I’ll have to give this a go with my two. 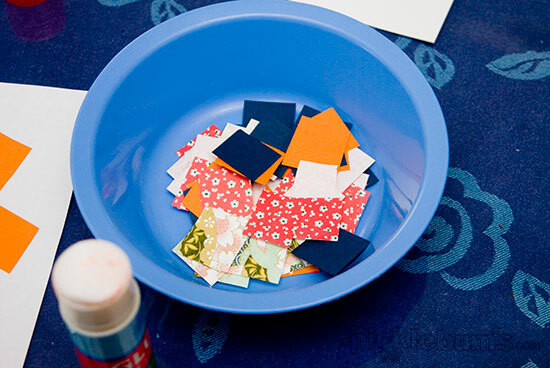 That’s a pretty good idea – I have so much origami paper lying about but it’s a pain for me let alone the kids to actually make origami, so fiddly! – so this is a brilliant idea that has one big thing in its favor – easy clean up! I often get filled with ideas of fabulous projects that we could do from reading too many blogs, but you are right, the simple things always work and that is most often what we end up doing. A really good ‘suits all ages’ craft and the little man turned out great. I think glue sticks are really practical for very young ones to grasp too. I wondered if you might join our Play Academy on Fridays – it would be great to swap ideas with you. Simple and fun. I must do this for my girls. Have to get more glue sticks as all ours dried up. Any recommended varieties? You are so right, we do a lot more of the ‘simple and fun’ creative projects than the elaborate ones but then that is probably due to an impatient toddler!! 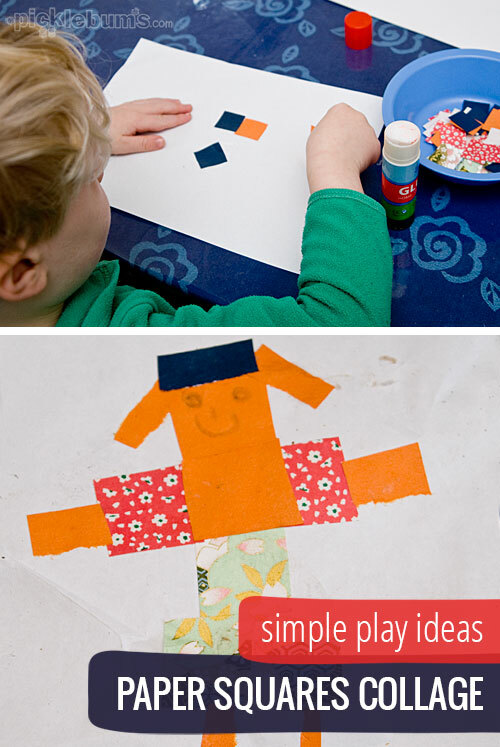 Home » Art for Kids – Keep it Simple Collage.